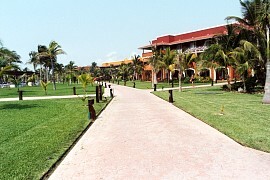 Barcelo Maya resort is on the Yucatan peninsula - we were on the Caribbean sea side (southern). 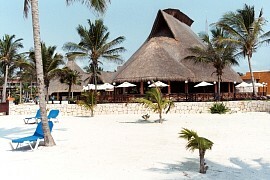 A travel agent helped us pick out Barcelo Maya resort south of Playa del Carmen. It is an all-inclusive 5 star resort. It is located 80 km from Cancun International Airport; 25km from Playa del Carmen. Our package included tranportation to and from the resort. Here some random shots around the resort. This is taken outside the dining area - there are two huge identical dining rooms that serve meals buffet style. 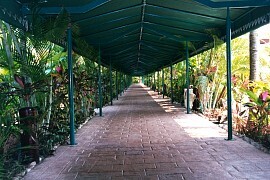 To the left is the walkway leading to the dining room. On the right you can just see some tables. I must report the food was *horrible*. How can steamed broccoli have a bad aftertaste? I rate the grounds and "A", the food an "F", and the adult drinks an "F". For the large amount of money we spent, I can't recommend this resort. I am not saying don't go, just be warned. 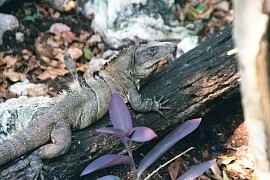 Iguana roam around the grounds near the walkways. 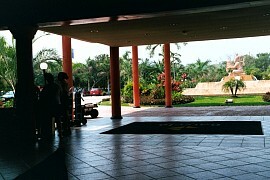 Most of the paths between the main lobbys (beach and jungle) and the three huge hotel complexes are covered. 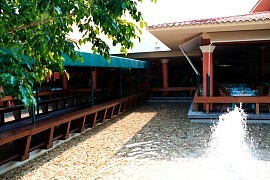 There are two large outdoor buildings that house places to to eat lunch and early dinner. One building also houses the Captain Morgan disco. 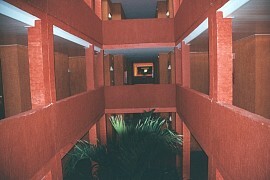 This is the view inside our complex. These are huge - many many wings with three floors each. They have cool open air gardens in the ground floor of each section - you can see the tops of the plants near the bottom of this picture. The orange area near the middle is the open courtyard of the next section, and beyond it you can see another. The floor are all tile. Everything is very clean. This is one huge resort. This is taken from inside one of the lobbys. Notice the statue of a Mayan figure outside in the fountain. They have many statues of Mayan figures located outside the lobbys, in each of the hotel courtyards, and outside by the beach. 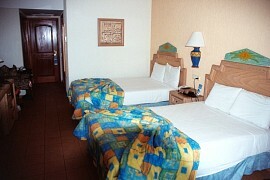 Here is our room with the beds turned down. The floor is tiled. We could not use the wall electrical outlets until the maid brought us some neutral-less extension plugs. We had a balcony and even TV - which surprised me. The U.S. went to war in Iraq just after we arrived - we listened to CNN every so often to see what was going on. This is taken outside on the grounds. In the foreground is one of the large complexes. Many workers were out each day grooming the grounds. I know the food service workers tried just as hard. I don't think the food was bad due to lack of effort. I can't emphasize enough how huge this place is. It was not even close to being full.